Parents from million-dollar Puget Sound to tough Southside neighborhoods unite to save Summit Sierra H.S. 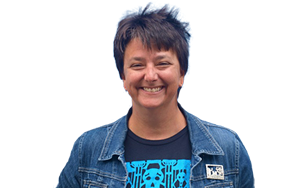 (Seattle, Washington) — Teacher Erica Baba is only a few minutes into a lesson on the Industrial Revolution when her ninth-grade history class skitters off track. She’s trying to tell a story about the wave of anti-Chinese sentiment that swept the West Coast in the 1880s when it becomes clear her students have wildly differing knowledge of local history. The controversial decision held that because charters, created two years ago by a ballot measure, do not have elected boards they do not count as the “common schools” entitled to receive revenue from the state’s general fund. Among the potential fixes before the Washington Legislature this year is a bill that would fund the schools with lottery dollars. 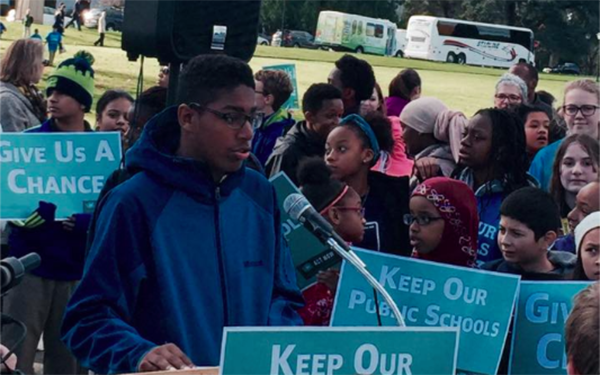 Carpooling from affluent hillside neighborhoods with multi-million-dollar views of Puget Sound and from blighted communities on the city’s Southside, students and parents have made the trek to the capitol in Olympia to lobby lawmakers. They’ve written letters and given tours and talked to reporters. Students have been making up for lost years of learning. More than half of entering freshmen were below grade level in math, and by an average of four years. Some 40 percent were behind in reading by an average of 3.5 years. Overall in the school’s first three months, students gained one year’s growth in reading and 1.25 in math. Still, teacher Baba has her work cut out for her. The neighborhood where the school is located has experienced more than one wave of anti-Asian unrest. In the one she is asking her students to discuss, Chinese laborers were moving out of railroad construction and mining towns and into the rapidly industrializing cities. In 1886, three days of rioting ended with hundreds of immigrants dragged from their homes and forced onto ships. On the wall Baba has projected a drawing of the violence. But as she talks, it becomes clear just one student has heard of the turmoil and of the law, the Chinese Exclusion Act of 1882, barring immigration from China. Another student jumps in, adding that Pearl Harbor was the reason the U.S. government confined Japanese Americans to camps. Someone else asks whether the Gold Rush had anything to do with industrialization. How to unite the disparate threads? Baba writes the word “Xenophobia” next to the images from the Washington Historical Society. And yes, she says to one student after another, the events being mentioned had major impacts on the area in Seattle now known as Little Saigon—but in different eras of history. The lesson goes to the heart of Sierra’s rapidly coalescing school culture. In an effort to recruit as diverse a freshman class as possible while complying with the law that says admissions must be race- and needs-blind, the school’s founders visited community centers, middle schools and social service agencies. The 110 students who signed up for Summit Sierra’s inaugural year come from all over the Seattle metropolitan area. Forty percent are black, and half of those are East African. The 28 percent who are Asian or Pacific Islanders descend from immigrants from Vietnam, China, Cambodia, the Philippines and elsewhere. Twenty percent are white and 12 percent Latino. 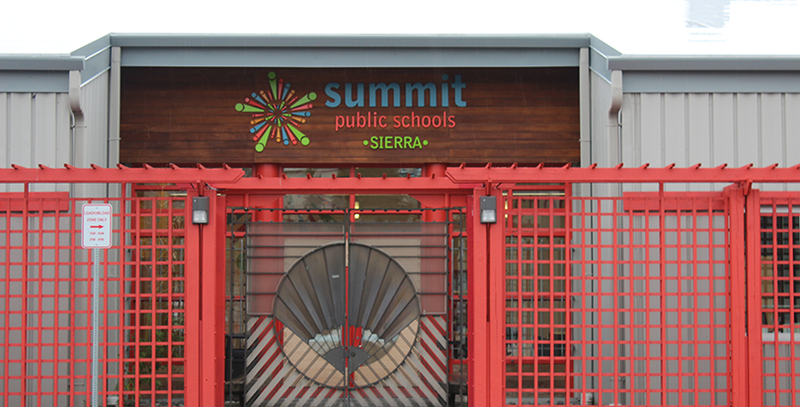 Twelve percent of all students at Summit Sierra have special education diagnoses, the same rate as in Seattle Public Schools, as well as a number of students on the less formal, so-called 504 plans sometimes created for kids with less intensive needs. The real number will ultimately be much higher, Burns believes. Jalen Johnson is one of the students who testified at the legislature in November and talked to individual lawmakers. He’s whip-smart — smart enough to have digested and poked holes in the logic of the court ruling endangering his new school — yet autism, obsessive compulsive disorder and ADD make school a struggle for him. At the start of the last school year, Johnson, who is African American, asked his very well-regarded mainline district school for an Individual Education Plan, the legal document outlining the special education services he would receive for his autism and other psychiatric diagnoses. His family’s request never received an answer, he says. In Johnson’s case, what that has looked like is a hodge-podge of placements where the sensory issues that make school overwhelming might or might not be taken seriously. He can’t, for instance, stand the scratching sound of a pencil. When he was very small his family enrolled him in a parochial school where he was allowed to wear headphones and to use a keyboard, which did not grate on his nerves. But good grades notwithstanding, when it came time to make the transition to middle school his family couldn’t find a Catholic program that would enroll Johnson. So he ended up back in a regular public school. The parents of other Summit Sierra students tell similar tales of trying and failing to get special ed services for disabled children. Margo Gilliland’s family lives in an affluent neighborhood with great schools, but has never received appropriate support for her dyslexia. In elementary school, she was pulled out of math class every day to read out loud to a dog, on the erroneous assumption that making reading more fun would somehow smooth the wrinkles in her brain. During middle school, her mother, Lynn Gilliland, shuttled her between two schools, a private one able to provide services in the morning and in the afternoon the district school Margo’s friends attended. Sierra works for the girl for the same reason it works for Jalen Johnson: A small, supportive atmosphere coupled with the intensive use of technology. Though they attend traditional classes, each student designs their own personal learning plan. When they are ready, they take an online assessment to show whether they’ve mastered a given lesson. In the process, she’s formed a close relationship with Natalie Hester, Victoria Johnson’s mother who lives on the very different Southside of the city. Hester’s laments about the lack of school choice in Seattle have to do with race and geography. Because Washington was still bound by the terms of the federal No Child Left Behind law, last year her fourth-grader was eligible to transfer out of their Southside neighborhood school, which was classified as failing. Unfortunately, the school she was eligible to transfer into was failing, too. Her older daughter Victoria had similarly lackluster options for high school. One was a school in a neighborhood that’s the site of frequent shootings. The other was Garfield High, a storied program that is home to one of the district’s two programs for high achievers. But the Hesters, who are black, knew that students of color were far more likely to be enrolled in the school’s regular program—literally separated from the high-flyers by a floor. Hester voted against the 2012 ballot measure that created charters. She was reluctant to send her daughter to one. But she attended a presentation Sierra’s founders made at Victoria’s middle school and came away enthralled with the idea of intentional diversity. And then, in the space of a few months, Hester found herself making the trek to the capitol to demand lawmakers find a way to keep the school open. Like many other parents whose personal experience throws the politics of school choice into stark relief, she was galvanized by spending time in a school where all kids are expected to achieve. On Jan. 20, a bill that would fund the schools using state lottery money cleared the Washington Senate. Passage in the House is less assured. Opponents, including the state’s teachers union, a plaintiff in the Supreme Court action, have mounted a vocal campaign to paint charter schools as a form of privatization. As a result, students who have come before lawmakers have fielded as many questions about teacher working conditions and school administration as they have about the programs’ ability to meet their needs. Jalen Johnson wanted to talk about the nuts and bolts of how technology helped him to meet his teachers’ high expectations. He was stumped when a senator asked how much his teachers were paid. At the legislative session’s first hearing on the charters’ future, students were asked a few critical questions about class sizes, admissions procedures and other adult concerns. But for the most part senators seemed pleased to be talking with young people and their parents about their experiences. Parents scrambled to the front of the room at her invitation. “Instead of stressing people out and not giving advice on college, you can fix this situation,” advised a Tacoma sixth-grader who said she was never encouraged to strive for higher ed at her old school. Another sixth-grader lost her place a moment into her testimony. “Are you good?” the committee chair asks after a short pause. So what happens if the safe haven is forced to close? Margo Gilliland has a ready answer. The school potentially has enough donors to ride out this year’s political fight. But in her opinion, what will really carry the day is the school’s success.